Anyone doing leather wrapped kydex? Discussion in 'Sheaths & Such' started by Big-Boy, Aug 7, 2018. I know this is my first post here, I promise it's not a troll thread. 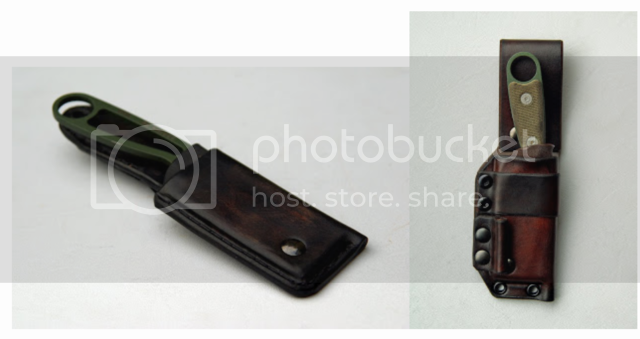 When looking a for leather sheath for my Esee Damascus Izula I stumbled across some pictures of something simple I liked. Ended up finding out it was leather wrapped kydex, and that it was by Martin Swinkles. Looked into his stuff because I wanted to order one and.....saw that whole story. This is not a Martin Swinkles thread, lol. However, I would like to know, did anyone fill the void on the type of sheaths he was making? I like the idea of the retention of kydex, but want the look and feel of leather. I would love something like what's pictured on the left. Dave Brown does leather kydex he's a member here on BF.